One of my customer called me for his Lexus ES250 misfire suddenly when driving.He described that his Lexus ES250 with30,000 miles usually engine misfired suddenly when driving without any omens.And after misfiring,sometime can restart the engine,but sometime can not. Scan the trouble code by GTS firstly,there is not any DTCs. Then tested the cars,but the engine misfire symptoms do not occur during we testing car. So,our technicians asked the Lexus ES250 owner to record the situation when misfire trouble appearing againt,include:speed,road condition,temperature,weather…. Several days later,the customer called back again and told our technicians that the misfire appeared again.After analyzing the data record by customer.And found the misfire usually happened on rainy day.So technician believe the misfire trouble was related to windshield wipers. Test car again,and turn on windshield wipers, as expected the Lexus ES250 misfire after a short distance driving,and it was be restarted at several time trying. 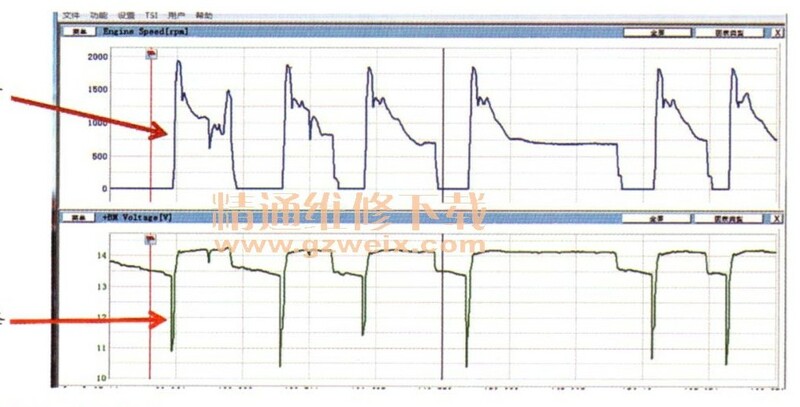 It shows that the ECU voltage declined when speed rising.Technicians found the not only power but also GND of ECU and windshield wipers use in common:A63,A2.And the GND bolts was loosened.After reinforcing the GND,test the car with windshield wipers turning on,the misfire trouble disappeared.